There are certain skills that take time to master such as learning a new language, playing an instrument, or learning to cooking. Learning these skills takes time, energy, practice, and trusting that you will improve with time. As a counselor, I find that our students rarely give stress management skills that same level of practice. I’ll often hear a student dismissing breathing exercises as something that doesn’t work after trying it only once or twice. Occasionally there are cases where students are incredibly surprised that the one relaxation exercise they did worked on the first try. The effects of relaxation exercises can show up quite early on. Yet more often than not the learning process can be messy with less than desirable outcomes, much like learning to cook. Learning these stress management skills are a great way to help break the cycle of chronic stress. Here’s how you can start the process in four clear steps. Firs, remember that stress is very common while in college and you do not have to be stuck with it. College is a stressful time in your life with personal and external expectations, pressure to accomplish a lot in such little time (and to do it well), and a lack of tolerance for a scary f-word (yes, I mean failure) are only some factors that weigh heavy on our nervous system. Stress is so common that 86% of college students endorse feeling overwhelmed by at least one task during their academic year (American College Health Association, 2015). That same survey suggests college students endorse stress as the number one factor affecting their academic performance. To learn more, read the American College Health Association National College Health Assessment spring 2015 executive summary. Simply put, stress is a part of life in higher education and it shapes your experience. Being able to recognize this fact is the first step you can take to manage it more effectively. Stress can show itself in different ways for different people. While some may experience physical pain others may feel overwhelmed, avoid people, procrastinate, lose their temper, or judge themselves. The list is long. The second step in breaking away from chronic stress is to recognize how stress shows up for you in your life. Review this list of reactions to stress and identify which ones you find yourself doing. Ask yourself: What are early signals? What are red flags that signal a break-down? Which signals are easier to notice and which ones are more likely to go unnoticed? 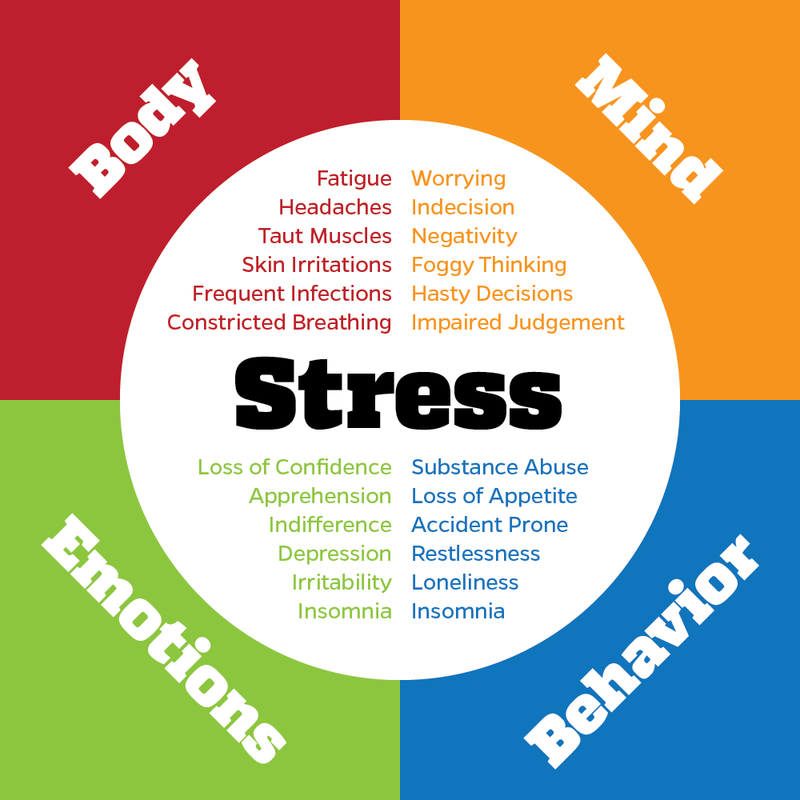 Take the time to get to know your stress reactions. Your third step is to recognize that stress reactions are simply your body and mind calling out to you. Like hunger alerts you that your body needs nutrition and invites you to eat, stress indicators alert you that your body and mind need relaxation and invite you to de-stress. You eat daily (I hope) because your body needs daily nutrition. Similarly, your nervous system needs you to engage in daily and intentional de-stressing, especially when going through stressful times (like, say, college or grad school). That said, stress is not necessarily a nuisance or your enemy. It “ups” your system; it gets you going. It can be your friend. (Listen to Kelly McGonigal’s Ted Talk for more about the positive side of stress). Stress gets in your way when you ignore it’s call for attention. Your way out of chronic stress involves daily attention to stress signals. Your last step is to pick your flavor of stress-management, so to speak. Your options are endless. If a certain way of de-stressing helped you in the past, go with it. If de-stressing is new to you or you want to expand your de-stress toolbox, visit the CWC’s Relaxation Videos page which introduces four basic ways to strengthen your nervous system. Each video is less than 7 minutes long. Take some time to practice them several times a week, and after several practices decide which one is the best fit for you. From then on, practice daily. To start practice for a couple of minutes a day, slowly adding more time as needed. Just like learning how to the play the piano, practice this new skill daily. Be patient with yourself and let go of self-judgment and expectations. Remind yourself that you are improving every time you practice and in matter of weeks or months you’ll find yourself free from chronic stress. You have the ability to manage your day to day stress if you allow yourself to engage in intentional and daily training. This training involves recognizing that stress is an inherent part of life, noticing the signs of stress, seeing these signs as a call to action, and engaging in a relaxation practice on a daily basis. This simple recipe is by no means easy, but has all the ingredients to get you out of chronic stress.